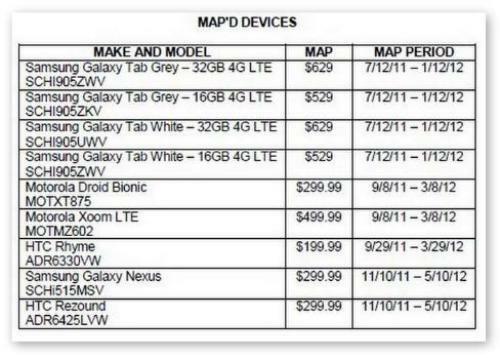 Samsung Galaxy Nexus and HTC Rezound prices have revealed through new Version MAP (minimum advertised list). I know the fans of this Google mobile phone are anxiously waiting for the launch of it and according to recent rumor it will launch in the next week. HTC Rezound and Samsung Galaxy Nexus have spotted on the map along with their release date and pricing plan. Just look at the image and then you will get an idea what will be the price of these devices and when exactly you will get them. The contract price of HTC Rezound and Samsung Galaxy Nexus are $299 while there is no detail about the full retail price of these handsets. Both handsets show 11/10 /11 – 5/10/12. Now it becomes clear that you will are not able to buy this handset before Novemeber 10. Some sources reported that the launch of Samsung Galaxy Nexus is possible on November 3 while that of Rezound is set to be October 20.